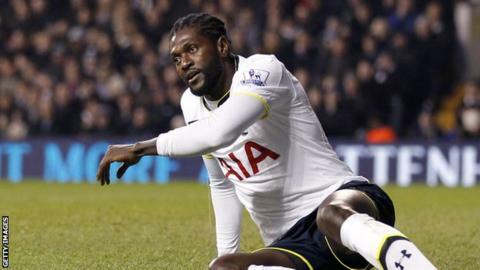 New Togo coach Tom Saintfiet has accused captain Emmanuel Adebayor of a lack of discipline after the Tottenham striker failed to join up with the squad on time ahead of their opening Africa Cup of Nations qualifier next weekend. "I saw him on Wednesday and Friday but he is not at the hotel," Saintfiet told a news conference in Lome on Friday. The Belgian-born coach was speaking before they departed Togo for their friendly in Ghana on Monday. "He is among the important players for the team but I cannot work with them when they are not in the squad. They should have the same discipline as others." Togo take on Liberia in Lome on Sunday 14 June in a Group A fixture that marks the start of their qualifying campaign for the 2017 Nations Cup finals. Adebayor's club Tottenham Hotspur gave him compassionate leave twice last season to return to Africa to deal with a personal family feud that the striker has discussed on social media. Two other key Togo players, goalkeeper Kossi Agassa from French club Stade de Reims and midfielder Floyd Ayite from Bastia, had also not yet joined up with the squad for preparations, Saintfiet added. "To me, discipline is very important in life. And that's what I am already trying to impregnate in the team. "Discipline is important both for the players, the staff, etc. Discipline is everything to me. All players must be proud to be selected and accept the rules. I want each player to know it's special to be selected for his country. "I have no problem with any player. Already I do not know everyone yet so I cannot begin to know who is who and who does what. "Since we assembled on Sunday, I'm happy to have those who are there," he added. Saintfiet was appointed last month as coach of the west African nation. Meanwhile, Adebayor has dismissed speculation that he is planning to leave Tottenham for a move to Turkey. Some media reports had linked Adebayor to a man posing as the player's agent. But on twitter, Adebayor vehemently denied the claims, saying he had never heard of the man claiming to be his agent, and had "never discussed any move to Turkey." He went on to say that he intended to stay at Spurs for another campaign. "I am very happy with Tottenham and look forward to the next season with them."